Abstract: "It's not for me, it for my DAD!" That's what I've been telling everyone when I picked up a retail Radeon 64 VIVO. Yes my dad actually does play games (mostly simulators) and ATI has always had a good reputation for having good image quality. The card also has a TV-Out so 'pop' can watch DVD's movies on the 35" TV instead if his dinky 17" monitor. In terms of performance, I wasn't expecting anything close to my V7700 Pro (GeForce 2 Pro) but I hoped that it would adequate. ATI has always had good performing chips on paper, but in real life, their cards were either released very late, plagued with incompatibility problems or had lousy drivers. 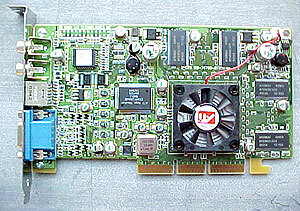 A prime example of that is the Rage128 based ATI cards. When they were first announced, they offered performance that would rival the mighty TNT or Voodoo2 but delay after delay finally landed the Rage128-based cards with totally different competition. There was no way it could even compete with a TNT2 or V3! No way! Has ATI learned from its mistakes? Well first off, they decided to intergrate a T&L engine into their Radeon line of cards (you can also get Radeon's without T&L now) so it could offload the Transform and Lighting calculations onto the videocard, thus freeing the CPU to handle other more important things such as AI, in game physics, etc. I guess one could say ATI was "mimicking" nVidia, but think of it this way, the technology has already been laid out, all ATI had to do was follow the path! Another innovation is HyperZ technology. HyperZ is based on Tile Based Rendering technology. But hold on... the Radeon can't do hardware tile based rendering! What HyperZ does, it enables texture compression to area's that are not visible. In a sense it's doing software based tile rendering! Back to Earth here, lets face it, there's no card that can keep up with a GeForce 2 in 16-bit colour, but that's not the realm that the Radeon was designed to "play" in. 32-bit colour is where the games are these days, and the Radeon can easily hold it's own. Let's see what the actual specs for the Radeon 64MB VIVO are. Pg 4. Quake 3 action?